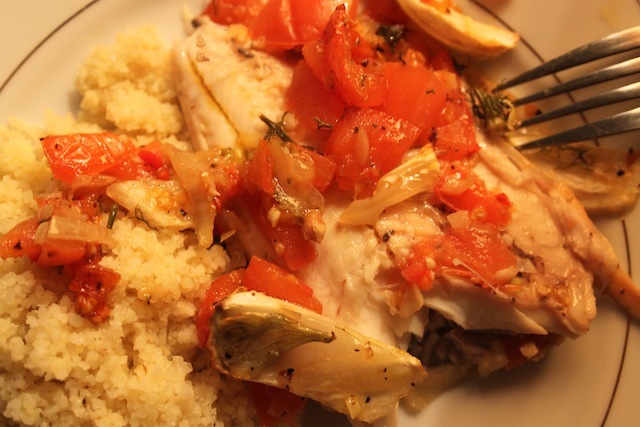 A Fish Out of Water Springs Back In: Roast Fish with Tomatoes, Lemon & Fennel – Eat Me. Drink Me. What’s nice about actually going to work – versus schlepping myself to a coffee shop for five hours where I pretend to write – is that it forces me to interact with people for a large portion of my day, where I apparently fulfill an unmeasured daily public communication quota which prevents me from talking to myself. Bonus. I ran my fish under cold water. 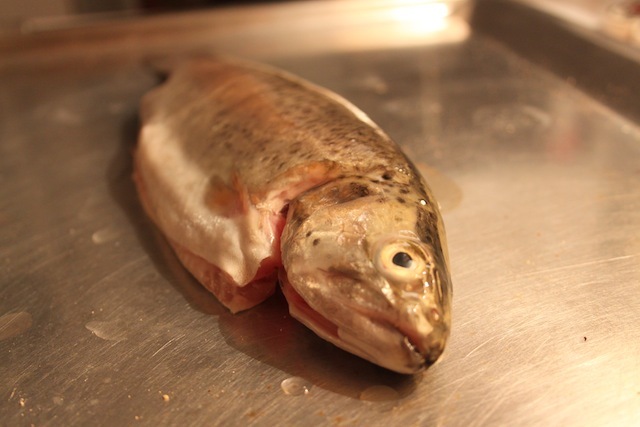 I don’t know what kind of fish it was – fish species never made it to my German vocabulary list – but it was smaller, silvery-brown with black speckles and a soft, white underbelly. It had little fish eyes and a little fish mouth which reminded me of my elementary school cafeteria lady. Like the Gestapo, she’d patrol up and down our neat, seated child-rows on the cafeteria floor and every so often would point to her sour mouth and say, It takes twice as many muscles to frown as to smile. Look what you kids have done to me. 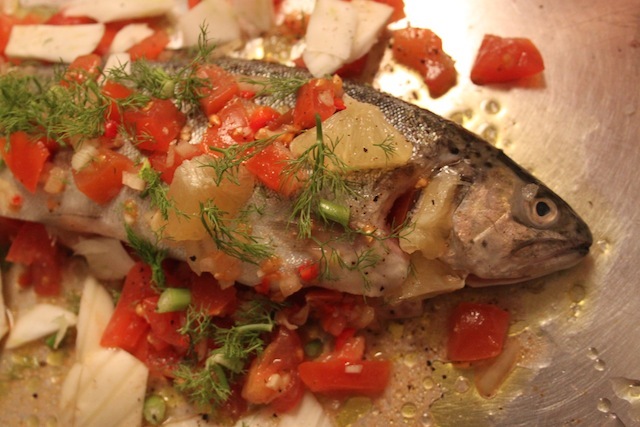 I roasted the fish simply, with tomatoes, lemon, garlic, and fennel, lots of olive oil and cracked black pepper. While it roasted, I thought quietly to myself, like most sane people do, read a bit, wrote a bit, did the dishes. And it was nice to know that the things I did were done because they had to be done in the two hours I had between the end of my work day and going out to meet someone in the evening. Schedules. I love them. Though really, I’m not sure how long I’ll love this being busy thing. When I’m not, I say I miss it. When I am, I only want a break. It’s all that green grass. Yet, somehow I manage to make it work – there is only one of me and what I have done is what I have done and what I didn’t do mostly doesn’t matter since it wasn’t what I chose to do. For now, I’ll be content with the productive bursts I feel in my few free hours, enjoy the experience of sitting in front of the oven, watching a fish roast, watching tomatoes and lemons leech juice. And of course, taking my leftovers to work and knowing my lunch is by far the best. Finely chop tomatoes, onion, and garlic. Add a healthy splash of olive oil, lemon juice, salt, and pepper. Stir to combine. I made this faux-bruschetta the day before, which I think really allowed the flavors to intensify. But I don’t think you have to do that if you don’t have time. Preheat the oven to 410F. 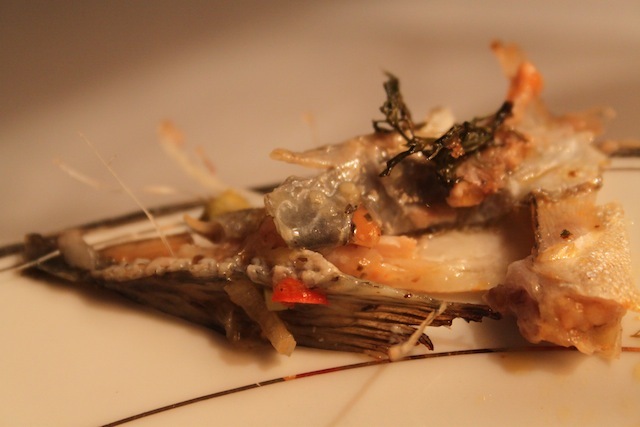 Place scaled and gutted fish in the center of a baking sheet. Drizzle with olive oil and rub with salt and cracked black pepper. Stuff the fish’s cavity with the tomato mixture and spoon the remaining mix on top of the fish. 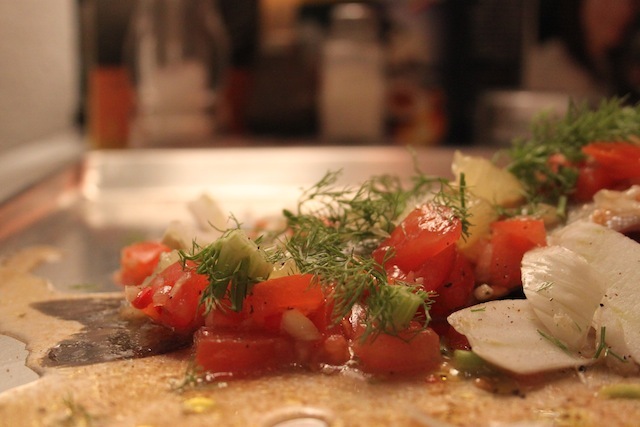 Nestle some coarsely chopped fennel around the fish and garnish with fennel fronds and lemon slices. Roast for about 30 minutes total, flipping at the 20-minute mark, until the flesh is white and the tomatoes have sunk into little, shriveled knobs.